After I started high school, the downtown Rutherford A&P Number 621 provided me with a steady job. The store looked much like the one in this picture. The manager, Mr. Bill Dietel, was a great boss. I quickly got to be a very fast and accurate checker, so he had work for me almost whenever I wanted it. We did not have scanners in those days, and the price of each item had to be keyed in individually. You had to know how to make change instantly—if the bill came to $9.62, the customer might give you $9.77 or $10.02 or something crazy, like $9.87 to avoid getting back smaller change. I rarely failed to balance out to the penny at the end of my shift. Once I was short $10 and I thought it was the end of the world for me, and the customer who would have benefited from my error came back to reimburse me just as I was ready to tell the boss. You had to instantly translate prices such as “3 for 37 cents” into “one for 13 cents” or two for 25 cents,” or even “4 for 50 cents,” as you could get an argument from the customer if you charged “two for 26 cents.” Prices did not change very often, and I memorized nearly all the common grocery items in the store. The pay was good, about 95 cents to $1.35 an hour. That was around 1949 or 1951. It got better and I kept working there through college and even into my first year or so of medical school. Mr. Dietel had twin daughters, both of whom graduated from Georgetown Medical School. 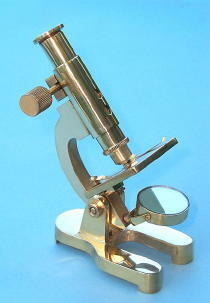 When he learned I was pre-med, he gave me a wonderful present: a beautiful pre-WWII brass German Leitz microscope that his daughters had used. (During my internship I was to use this instrument at home to diagnose a case of malaria that the hospital lab had missed. They just did not spend enough time on the thick blood smears. I was convinced that the patient’s travel history and clinical picture fit, and indeed I found the malarial parasites after a careful search). We unionized, and I became a charter member of the Amalgamated Meat Packers and Butcher Workers Union. I had a little book in which I kept the stamps that served as receipts for dues payments each week. Mr. Dietel allowed me to work whenever I could find the time, even at night when the store closed, taking inventory and stacking shelves. This really helped with my tuition and other expenses. I held other jobs while still working part time at the A&P. I landed the coveted job of driving Klemeyer’s liquor store delivery truck. This I did for an entire summer after I turned seventeen. I had one customer who could consume a case of Johnny Walker Red every week. He did look the worse for wear! Another lady insisted that her regular delivery of a dozen fifths of gin be disguised in a vegetable box. My bosses at Klemeyer’s were George Rupp and Herman Raven. They were as different as night and day—George was happy-go-lucky while Herman seldom smiled and took everything very seriously. It was cool driving that blue Chevrolet truck. It had a stick shift and groaned nicely when I gave it the gun, away from the store, of course. I could not smoke in the family car, so it was such a pleasure to park my cigarette on already well-soiled ash tray. I had a 2 pack a day habit. May 7th, 2012 at 8:35 pm It was wonderful reading your article. I remember the old store front and next to it was Tammy’s Hardware. My grandfather was George Rupp. He was a wonderful man with a big heart with a lot of wisdom of life to go with it. I remember how much fun it was to go upstairs over the garage and not get caught by Uncle Herman. Best part of childhood was having the review stand close to the store. My grandfather would be out there and so would his cronies from Tammy’s Hardware and White Front Meat Market on the corner of Beech Ave and Park Ave. Thanks for the blast from the past.